©J Dijkema/G Konnen, shown with permission . The bow below the horizon does not match the one in the sky. The upper bow is an ordinary bow made by falling rain. 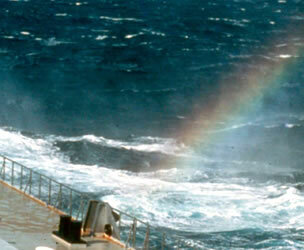 The lower bow was formed by sea spray. 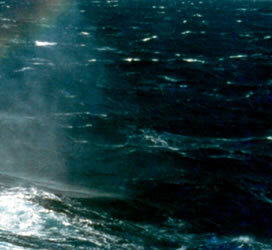 The sea water bow has a slightly smaller (by ~0.8°) radius because salty water refracts light more strongly than rainwater. Materials that refract light even more strongly produce smaller bows still. Glass makes bows about half the size of rainwater bows. Photographed in the Pacific Ocean by J Dijkema.